Stimulus – The moment when a consumer sees an ad for the product. The Zero Moment of Truth (ZMOT) — The online moment at which a consumer first develops an opinion about a brand/product, prior to encountering it in the physical world. This can also be referred to as the digital path to purchase. 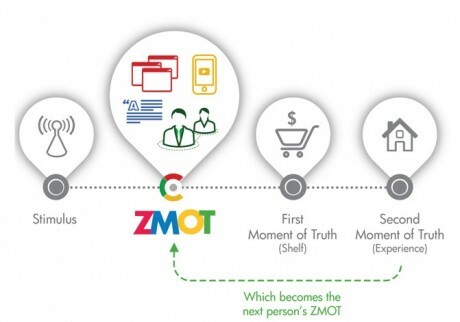 ZMOT occurs after a consumer sees an ad for the product, but before a purchase is made in store. Precisely, it occurs at the moment when a shopper goes online to research a product and decides whether to make a purchase. Some examples of ZMOT are online ratings, peer reviews, videos and in-depth product details as consumers move down the path to purchase. First Moment of Truth (FMOT) - The three to seven second moment when a consumer sees a product on the store shelf for the first time and considers purchasing the product. FMOT is the moment when all the advertising a consumer has seen for a brand will either pay off with a purchase, or not. Second Moment of Truth – The moment when a consumer uses the product for the first time. This can also be referred to as the experience.